Since medical cannabis is still illegal at the federal level, some patients feel nervous about bringing it up to their physician or primary care doctor before applying for a medical card. While this is understandable, our clinicians and medical marijuana doctors at Medical Cannabis Outreach are here to reassure you that there is nothing to be scared of when it comes to discussing alternative treatment options with your physician. As your healthcare provider, it is their responsibility to put your needs before their personal beliefs or political views, and you might be surprised to find out that most medical professionals nowadays are open to having that discussion with you. Here are a few tips for how to talk to your physician about medical cannabis. One of the first steps in getting a medical marijuana license is consulting a physician for approval and getting written certification from them within 90 days of submitting your medical card application to the Illinois Department of Public Health. Therefore, the best thing you can do to prepare yourself and prove your intentions to your physician is to become educated about the benefits of medical marijuana and CBD oil before going in for your appointment. While many of the benefits are still unknown or are currently being studied at both the state and federal levels, most doctors will agree that there is potential for medicinal marijuana to aid in symptom and pain relief. When you are doing research in the days or weeks leading up to your doctor appointment, be sure to also learn a little about the endocannabinoid system and how it works in the body to regulate overall health and fight off disease. Be careful though — most doctors are hesitant to agree that “medical weed” or “medical pot” can cure any type of disease, so it’s better to state indisputable facts, such as its therapeutic properties for managing pain and alleviating some symptoms (e.g. nausea, insomnia, anxiety, lack of appetite, types of seizures, etc.). If you have enough evidence to back your claim that medical cannabis can help you live a healthier, happier life with one of these severe or debilitating health conditions, your physician should have no reason to deny you approval. It should go without saying that any questions, concerns, or discussions you have with your doctor are confidential, meaning that they cannot disclose any of this information to your parents, friends, or anyone else. That being said, approach the conversation calmly and with an open mind, sharing your honest thoughts on how medical cannabis could be of benefit to you. And, if you disclose to your doctor that you are currently using marijuana illegally and would like to get on a medically approved plan, your doctor cannot judge you or report you to the authorities. This is not to say that they would, but just know that you and your doctor are both protected in the clinical setting with regard to private conversations. So, if you are suffering from cancer and are looking for a natural way to alleviate some of the side effects of chemotherapy, be honest with your doctor and tell them what you have done before or are willing to try. Trust us when we say that your physician has likely had many other patients with the same questions and concerns about beginning medical marijuana treatment and that nothing you say will make them think any less of you. Remember, you and your doctor are both here to optimize your health and wellness, and in many cases, your healthcare provider would rather provide a written recommendation for you to get a medical marijuana card than prescribe you with an addictive painkiller or synthetic opioid. Now that you have a few bits of advice about how to approach your physician about starting medical cannabis treatment, it’s time to take the first step in your journey with medical marijuana and/or CBD oil. Please don’t hesitate to reach out to us if you would like more information about the medical card application process, or feel free to visit one of our six medical marijuana clinics throughout Illinois. We are pleased to offer medical cannabis clinics in Chicago, Savoy, Pekin, Shelbyville, Wood River, and Harrisburg, as well as mobile wellness clinics throughout the area. 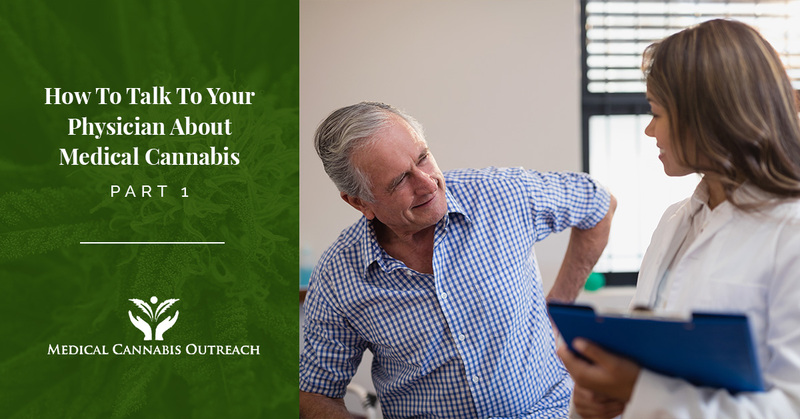 If you’re worried about how your doctor will react when you ask them to provide a written recommendation for a medical cannabis card, our in-clinic physicians at Medical Cannabis Outreach would be happy to provide a quick and easy approval. Our free medical card application process is simple, with an initial consultation and evaluation, followed by professional assistance filling out the application, paying the mandated state fee (per your registration term), and taking your photo for the medical card ID. Ready to get started? Continue to part two of this blog series for more expert tips, or contact us today!